The JVC CCL550i2 (formerly Totoku CCL550i2) is the first color display which is also suitable for mammography. With a 5 Megapixel native resolution and a high brightness and contrast – you won't miss any bit of information. 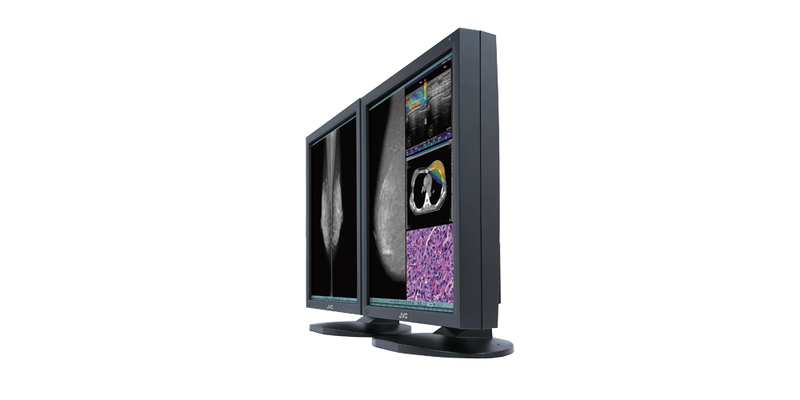 Users will enjoy the benefits from displaying Mammo Images, Pathology images or ultrasound at the same time – all on the same display. With this model JVC monitor has introduced many useful new functions. The JVC CCL550i2 provides all the functionality of a color display, with the grayscale accuracy required in mammography. With the JVC Software solutions and remote management you become the QA expert. The Medivisor suite makes calibration and testing as simple as possible. With PM Medivisor you enleash the full remote functionality. All remote features are so advanced that you don't even get noticed. The integrated front sensor checks constantly the image quality. This data is send to the server and avaiable by a webinterface you can access from any workstation. Calibration tasks can be scheduled and executed remote with the front sensor. This cuts maintenance time and effort. The email notice function sends messages in case of too high ambient light, changed configurations or trouble. JVC is committed to providing high performance display systems that are ecological and environmentally friendly. We strive to create green IT initiatives and be a part of building a clean energy future. In order to achieve this, we have incorporated new power-saving features in our i2 series displays. The internal power supply system includes a newly improved power save mode, which allows the display to enter standby mode with less than 2 watts of energy consumption. High brightness displays like the CCL550i2 are needed for accurate diagnostic imaging and analysis. JVC has developed the auto text mode to detects white areas and dims the brightness accordingly. This ensures eye friendly viewing without any influence on the remaining diagnostic area. This dynamic gamma feature works out of the box, and no client software or configuration is needed for this function. In addition to a DVI port, each i2 series display includes the latest in digital display interface, DisplayPort. When using the DisplayPort, up to 1024 or 10-bit shades of gray are simultaneously displayed. This enables smooth and accurate display of subtle differences in shades of gray. Additionally, 1073.74 million colors (10-bit in each R, G, B) are simultaneously displayed on the JVC CCL550i2.